January 15, 2018 – Our time machine travels back to the Union-occupied city of Alexandria, Virginia, to get an abolitionist woman’s perspective during America’s Civil War. Our guide on this journey is Paula Tarnapol Whitaker, author of A Civil Life in an Uncivil Time: Julia Wilbur’s Struggle for Purpose . Paula met up with us in Virginia at the Lyceum, Alexandria’s History Museum, where we felt close to this woman ahead of her time. In the fall of 1862, with the Civil War raging, 47-year-old Julia Wilbur said goodbye to the family farm near Rochester, New York, and boarded a train to the capital of a divided nation. An ardent abolitionist, Wilbur spent most of the next several years in Alexandria, Virginia, just across the river from Washington, D.C. Pushing back against the limitations women faced at the time, Julia Wilbur aided escaped slaves and hospitalized Union soldiers, later serving in the Freedman’s bureau as African-Americans made their first steps to full citizenship. 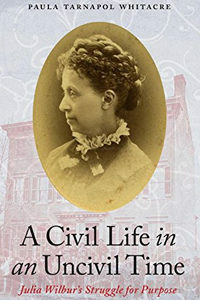 Based on diaries, letters, and other primary sources, A Civil Life in an Uncivil Time introduces us to a woman who threw herself into a changing society, and helped bend it in the direction of liberty. You can find our guest online at PaulaWhitacre.com, @PTWhitacre on Twitter, or Facebook.com/PTWhitacre. *According to our new schedule, our next episode will be on January 29th.